Armscor USA 223 Remington Ammo 62 Grain Full Metal Jacket ammo review offers the following information; Originally designed in the Philippines, Armscor ammo started it humble beginnings back in 1905 by two Englishmen who wanted to create a trading company, after a few years this company flourished into the world renowned leader in both ammunition and firearm that the shooting community knows today. As one of the largest leading ammo suppliers in Southeast Asia, Armscor is widely used by military/ police and combat shooters for professional use and training needs. Though the company originates in the Philippines, the Armscor USA line is assembled in the US and available on the civilian market at an extremely economical price. This is a ISO 9001 Certified Company, complies with the SAAMI, CIP and other military or customer desired standards or requirements, making them one of the most desired companies for military personal to work with. Armscor carries a wide array of calibers in pistol, rimfire and rifle ammunition, ideal for all consumers’ needs and wants, including this 223 Remington ammo. All Amrscor ammunition is designed using only the highest quality components and put through grueling tests to ensure a quality performance for all end users. 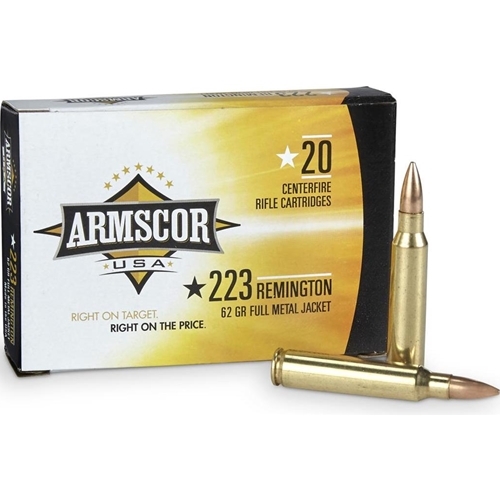 Like all ammunition sold by Target Sports USA, Armscor USA 223 Remington is new production ammunition. 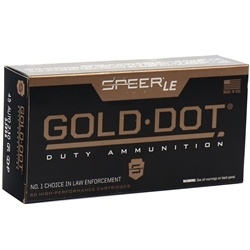 This 62 Grain Full Metal Jacket ammo is re-loadable and features brass casing and boxer primers. Armscor USA 223 Remington ammo is packaged in boxes of 20 rounds and cases of 1000 rounds, and as always enjoy free shipping on full cases of ammunition. This is a ISO 9001 Certified Company, complies with the SAAMI, CIP and other military or customer desired standards or requirements, making them one of the most desired companies for military personal to work with. Muzzle Energy 1136 ft. lbs. The ammo looks and shoots clean. Did not group well out of my 16" 1:7 twist 4150 CMV melonited barrel, or my friends 16" 1:8 twist 416R barrel. Group sized averaged between 6" and 7" maximum spread at 100 yards. Wolf Gold, Perfecta, and PMC Bronze all averaged 2.5" maximum spread or less from the same rifles on the same day. 4 group averages. Even Wolf steel case averaged 4" groups which are 33% better than this. I recommend looking elsewhere. Nice range and target ammo. Clean well constructed rounds which always feed and eject well. I use these with my Ruger Mini-14 and the rounds seem fairly consistent and accurate. I will continue to use them as range ammo. At distances of 50 &100 yards I can get groups comparable with any other rounds that I shoot.